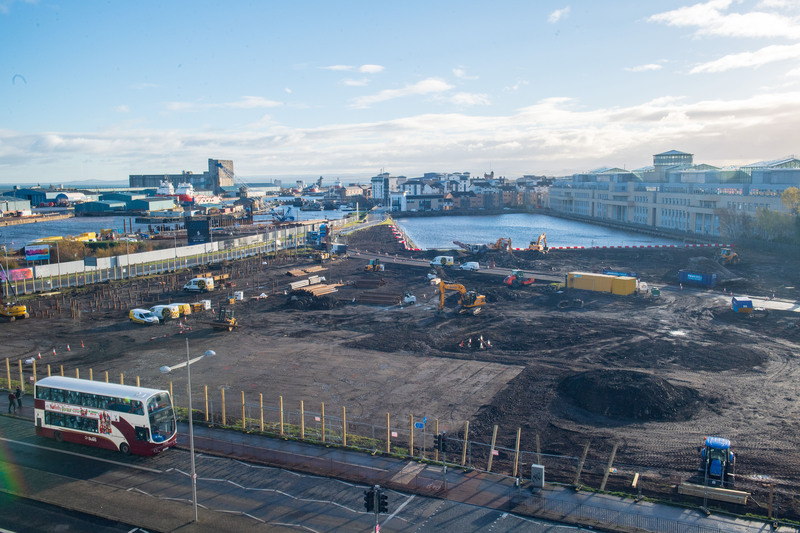 Work on a residential transformation of long-term disused land at a prominent section of Leith’s waterfront is now underway. The Waterfront Plaza project by CALA Homes (East) located opposite Ocean Terminal will see the creation of 388 homes, along with 1500sq.m of flexible workspace units inspired by The Arches at Market Street near Waverley Station. Urgently-needed affordable homes also comprise a key element of the development, with 82 to be built and brought to market by a housing association with a further 15 units delivered through the City of Edinburgh Council’s Golden Share model. Despite being initially recommended for refusal due to historic zoning for a commercial-led scheme, the brownfield site was unanimously backed by councillors after receiving strong support by local community leaders, businesses and politicians. A number of those supporters, including Councillors Adam McVey and Gordon Munro - as well as representatives from Forth Ports, visited the development in recognition of work starting. 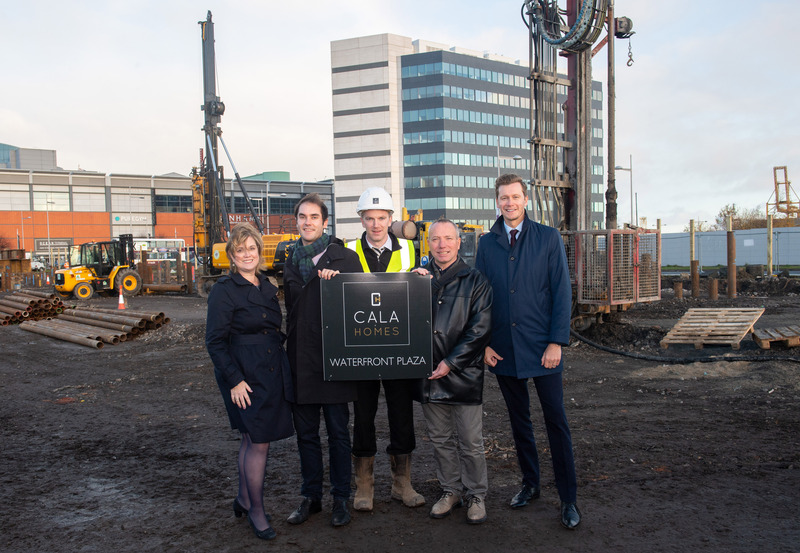 Craig Lynes, land director at CALA Homes (East), said: “This is a milestone moment for Leith’s famous waterfront and will make a significant and tangible difference to the prosperity of the wider area. “The community and key stakeholders have played a crucial role in helping us to get to this stage - as constructive feedback early on in the process helped us to amend plans in a way that really works. “I would like to thank all of those who have positively engaged in the planning process and offered that support. “By responding to the demand for a range of high-quality homes, improved public realm and connectivity to the Shore from Ocean Terminal, the site represents a success story for the council’s planning system. It has realised the potential of a brownfield site which has lain derelict for decades. Bosses at the neighbouring Ocean Terminal were among the supporters, along with 41 of its businesses. Further supporters include Forth Ports, Port of Leith Housing Association, Leith Chamber of Commerce. The city’s Lord Provost, Frank Ross, also offered vocal support for the site during the planning process. Waterfront Plaza includes a wide mix of homes from flats to large townhouses - and even a modern take on the city’s iconic colonies. Given the green light in December 2017, it is hoped that the show complex will be launched in summer of 2019 with first homes occupied towards the end of the year. It is anticipated that an eclectic mix of ‘workspace’ units complemented with the proposed public realm, (an urban square and public green space along with a café building fronting Victoria Dock) will also draw more visitors to the area and keep them there for longer, in line with local ambitions to increase the retention of visitors in Leith. Speaking following his visit to the site, local ward councillor Gordon Munro, said: “There has been a lot of talk over the years about what would happen here. Local councillor and City of Edinburgh Council Leader, Adam McVey, added: “This development has a strong sense of place and strong understanding of Leith. Pamela Smyth, general counsel and company secretary with Forth Ports, said: “It’s great to see work is now underway at Waterfront Plaza. The proposed development presents a range of apartments and family homes, to include 33 semi-detached and terraced townhouses, 27 colonies, 328 apartments, plus 29 ground floor workspaces fronting Ocean Drive. The development continues CALA’s recent success and commitment to transforming challenging brownfield sites to deliver important homes for the city, with previous developments including nearby Albert Dock and Trinity Park.